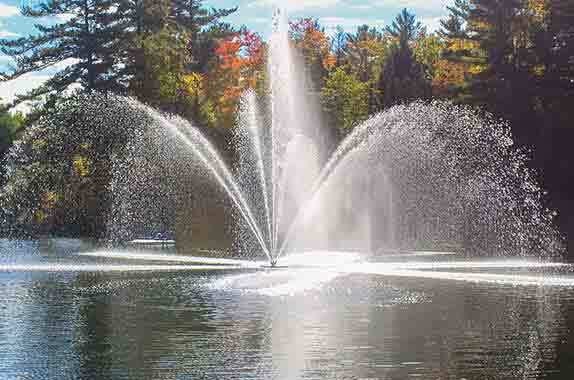 The Lotus Lake Aerator is the widest diameter spray pattern. The Lotus is like an open flower on your pond. The propeller is protected by the aerators motor mount. It provides generous water flow and protects the unit from large foreign objects. Powered by a stainless steel, water-cooled & water lubricated submersible motor. Mooring ropes included with purchase. Optional intake screens are available for all aerators. The optional intake screen is used with a pond aerator it will provide additional weed, fish, and trash protection. Installation is quick and easy. Bolt pump motor mount to float with supplied fasteners. Turn the float over and put it in the upright position. Connect removable heavy duty power cable to pump connector. You are ready to launch aerator in the water. Bring aerator to the desired location, tie the mooring ropes to the float and fasten ropes to shore posts or anchors. Alternatively cement block anchors can be used in bottom of pond. Run power cable to shore. Have your electrician connect power and pump to control panel. You’re done. Time to enjoy! 49.2 feet(15m), 98.4 feet(30m), 147.6 feet(45m), 196.9 feet(60m), For longer lengths please request a quote with any length and specify length needed in additional information. All Arbrux floating pond aerators come with a 3 year warranty. Each aerator is electrically safety tested and listed with ETL to CSA and UL standards.